"If you've never made a mistake in your life and you're perfect, don't listen to this." My name is Bryan. The importance of voting really hit home when my youngest daughter got sick. Dealing with the health care system showed me how important it is to have a say in policies that affect your family. I can't vote because of my past, and that impacts my ability to care for my family and go after some of the goals and aspirations that I have for my future. On November 6th I can regain the eligibility to vote along with 1.4 million Floridians like me, if Amendment 4 passes. I hope you'll promise to vote on my behalf, for me and my family. 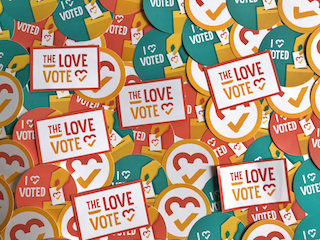 Show Bryan love + inspire others + get voting info + get event invites + get stickers + create change!